“Miss Lady Lace is the tantalising temptress from the West, she graces the stage with her glamorously classic style, creating a world of illusion and opulence with each step she takes. Lady Lace is a burlesque artist & teacher based in Perth Western Australia, working professionally since 2010. She has worked very hard to become a highly recognised performer in Australia being interviewed and featured in numerous national and international publications. She has performed all over Australia, including at the Melbourne, Brisbane legs of the Australian Burlesque Festival as well as Sydney and Adelaide. She has also performed extensively all over Perth as well as travelling to New Zealand in 2017 to perform in their burlesque festival. She has worked for a vast range of high-end shows, corporate functions, and festivals. 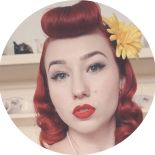 Lady Lace also teaches cabaret, burlesque, pinup, and other styles of vintage dance. Miss Lady Lace specialises in classic burlesque performances where she creates opulent acts reminiscent of the golden age of glamour. She adores to incorporate large props such as her giant martini glass, giant teacup, giant bubble bath, giant spaceship, and giant feather fas among others. Performances in her giant martini glass. Hi I was wondering if bigger older ladies can do your Burlesque class, also would I need any special costumes or props. I would be coming on my own and I feel I am a bit uncoordinated but love the look of this style of dance.